March On.... | A.B.E. Remodeling, INC.
We're marching on....continuously moving through 2015. 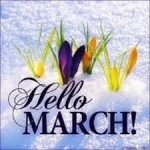 We say Welcome March. It came in like a lion...so it has to leave like a lamb. March - bring us the sunshine, melt the winter blues. Let us get rid of this "cabin fever" frame of mind. We're all anxious to see those spring flowers pop through the ground bringing us new hopes. The birds too are looking forward to the plush greens of spring making it so much easier for them to find there food. We are all thinking..no more snow and wintry conditions for this winter... we just want our springtime now. As I sit here and look out over the fresh snow we got yesterday-it is pretty...but now that it is MARCH. Bring on the SPRINGtTIME.